The Russian Defense Ministry (MoD) will begin upgrading its fleet of Sukhoi Su-30SM multirole fighter jets, classified by the Russian Air Force as 4++ generation fighter aircraft, in 2018, according to Russian Deputy Minister of Defense Yury Borisov. “We plan to kick off modernization this year, complete its first stage in 2019 and then start [deliveries of] upgraded vehicles,” Borisov said on February 8. The retrofitting of the fighter jets will include avionic and weapons systems upgrades. The Su-30SM will be adapted to carry a host of a new weapons systems, including the KAB-250 guided bomb and the air-to-surface Kh-59MK2 cruise missile. The 256-kilogram KAB-250, an aerial bomb that can be laser-guided or satellite guided, is the Russian equivalent to the American Small Diameter Bomb (SDB), a precision-guided glide bomb. The Kh-59MK2 is the stealth, standoff land-attack variant of the Kh-59 Ovod, a Russian TV-guided cruise missile, originally developed to strike naval targets. The Kh-59MK2, with a purported maximum range of 550 kilometers, is specifically designed to destroy stationary land targets with no radar or infrared signature. The Russian Air Force reportedly operates around 100 Su-30SM fighter jets. In 2017, the Russian MoD procured 17 additional Su-30SMs; up from 16 the year before. 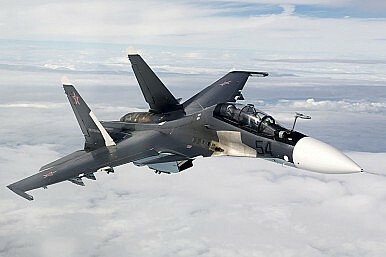 Overall, the Russian MoD intends to procure a total of 116 Su-30SM aircraft, according to the current State Armament Program. This year, 14 more aircraft are expected to be delivered to the Russian Air Force, based on a contract signed between the MoD and Irkut Corporation in 2016. The Su-30SM is based on the Su-30 MKI export version, an aircraft jointly developed by Russia with Hindustan Aeronautics Limited for the Indian Air Force. However, the two-seat SM is a localized variant of the MKI and unlike the latter does not contain Israeli and French avionics. It retains, however, the same airframe made of titanium and high-strength aluminum alloys and also features the MKI’s AL-37FP thrust-vectoring engines among other things. Su-30SMs have been engaged in bombing missions and acted as escorts for other Russian military aircraft in Syria. “They performed in the best possible way in Syria and proved all their capabilities,” Borisov said last week. This month, a Russian Air Force Su-25, designed to provide close air support for ground forces, was shot down over Idlib, Syria by rebel fighters using a man-portable air defense system (MANPAD).